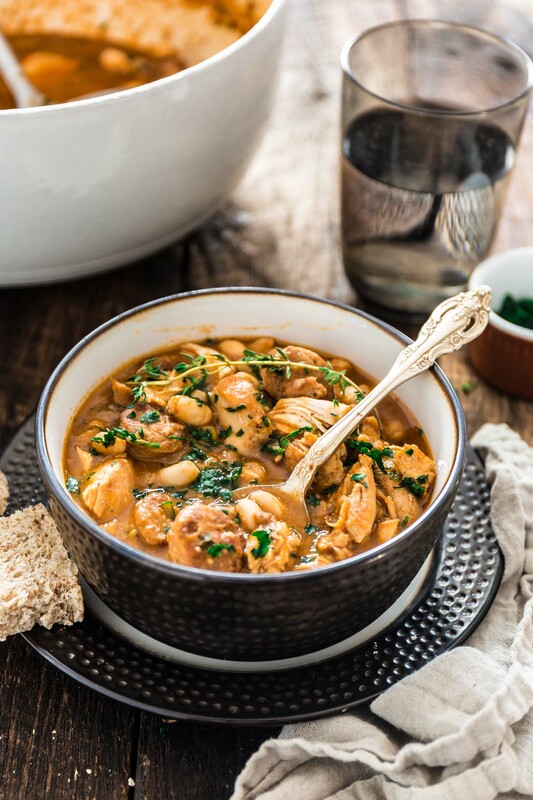 A hearty and comforting Brazilian Paprika Chicken Stew is possibly one of the best ways to warm up this fall/winter. It is also very easy to make and done in one pot! If you’re not yet familiar with Brazilian cuisine, chances are you don’t associate it with comfort food. After all, aren’t Brazilians at the beach all the time, drinking caipirinhas? But despite our tropical weather, our cuisine is full of hearty soups and stews, succulent roast meats and chicken, breads and all types of decadent desserts. So if you’re feeling like you need some cozy noms, grab the closest Brazilian cookbook (or, well, maybe come to this blog? ? ), cause you will surely find something to warm your heart and lift your spirit. 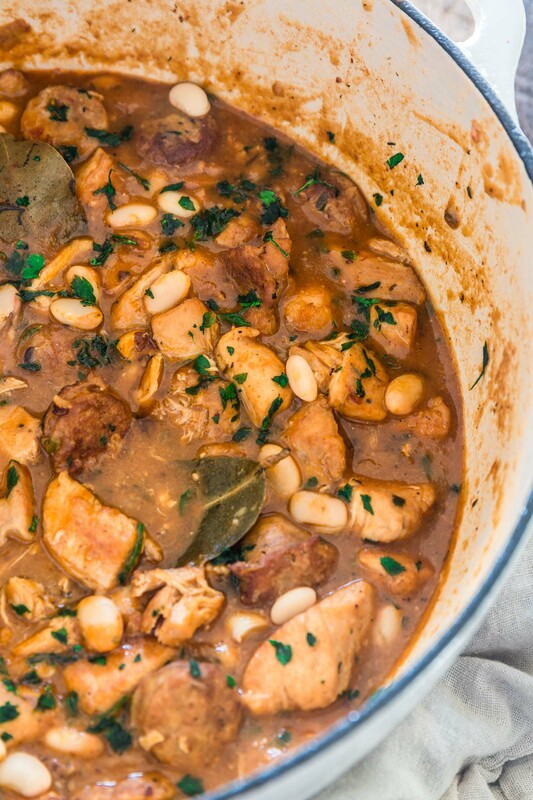 Like this Brazilian Paprika Chicken Stew with White Beans, for example. Give me a bowl, my couch and my favorite Netflix show and I’m all set! No sucky day can resist this delicious medicine. 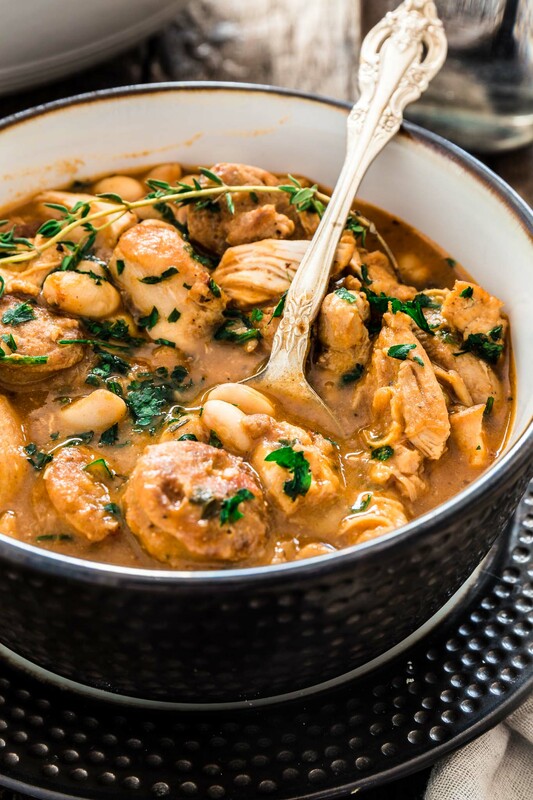 Now, you will find that this recipe is quite similar to the Hungarian Chicken Paprikash, minus the sour cream and with the addition of sausage and white beans. And no, that is not a coincidence. Brazilian cuisine is highly influenced by European cuisine in general. For example, one of our most popular dishes – made every week at every Brazilian household – is our version of stroganoff, or estrogonofe as we call it. It is my favorite dish in the whole world and I already shared my recipes for both the beef (my first post ever!) and the chicken versions here on the blog. I actually spent a good part of my life thinking it was a Brazilian dish. It was only after I became a self proclaimed foodie that I learned it was actually a spin off from the famous Russian version. Confused much? I know, Brazilian cuisine does that to you! Despite the name, this dish is not super hot. Unless you want it to be, then – by all means – add all the paprika you can take and go to town! Gee, you could even add some cayenne pepper if you want a bigger punch. Me? I am happy with a little kick but I am not into extremely spicy food. Another misconception regarding Brazilian food is that our cuisine is spicy. Sure, we do have our hot dishes (especially in the North, but in general Brazilian cuisine is pretty mild. 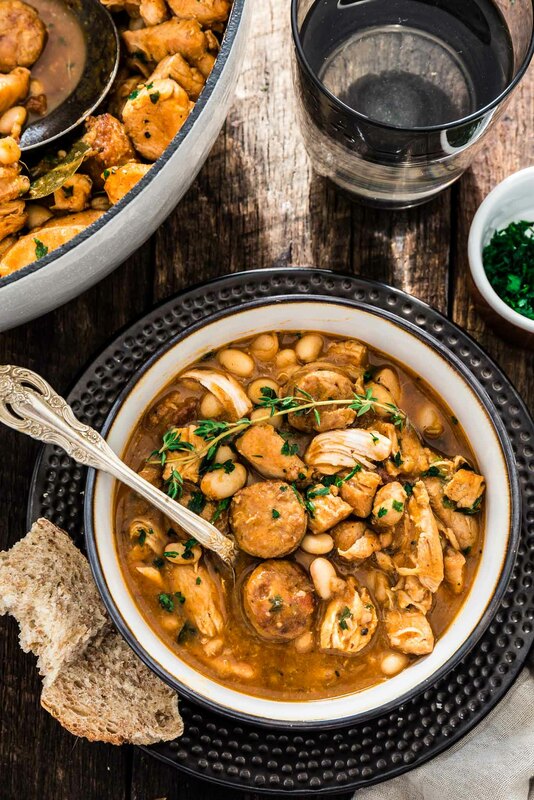 To stay on the chicken theme, I chose to add chicken sausage to this Brazilian Paprika Chicken Stew, but any sausage will work. I know some people skip the browning the chicken/meat when making stew, but I can’t stress enough how much flavor you would be missing if you skip it. Searing the chicken is an essential step for making a great stew. This is where the stew really starts to build its deep, rich, flavor. It’s an extra step and a little bit of work, but you will be rewarded with an extra delicious stew at the end, so it’s totally worth it! I imagine it is no surprise that we – Brazilians – serve our Paprika Chicken Stew over rice. We love our rice and we eat it with pretty much anything, especially saucy food! If rice doesn’t rock your boat, you could serve your stew with egg noodles, potatoes or just with bread. A good crusty bread to mop up all that goodness from the bottom of the bowl is always a good call! In a large bowl, toss the chicken and sausage with the lime juice and season with salt and pepper. Heat 3 tablespoons of oil in a dutch oven, over medium high heat, and brown the chicken and sausage, about 2 minutes per side. Depending on the size of your pot, you will have to work in 3-4 batches, adding more oil when necessary. Remove the chicken/sausage to a plate. Lower the heat to medium, add the remaining oil and sauté the onions and garlic until softened, about 3 minutes. Then, add the paprika and the tomato paste and stir to combine. Pour the chicken broth and add the bay leaves and thyme. Once the liquid starts boiling, reduce the heat to low and let the stew simmer for 30 to 40 minutes or until the chicken is cooked through and almost falling apart. With a ladle, remove a bit of the broth into a cup and stir in the flour to make a roux. Return the roux to the pot and add the beans. Cook for 10 more minutes until the sauce has thickened. Taste for seasoning and add more salt and/or pepper, if necessary. Remove the bay leaves and sprinkle the parsley. Serve immediately, over rice or with bread. 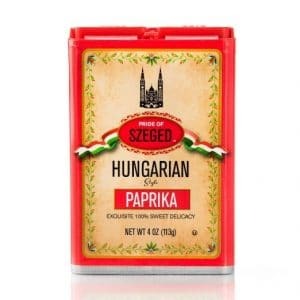 Paprika? White Beans? Cooks in one pot? those are all magic words and I want to make this! I think a lot of people confuse spicy with heat. I love both, but flavorful doesn’t have to mean hot and this sound lovely Olivia. I could go for a bowl of this right now! This stew was so good! I followed the recipe as far as the meats and spices go but I did add 2 diced potatoes and some chopped kale and it was great. I loved the different flavours. It was a nice change from my regular chicken stew I do. We had this over rice with a nice salad. Perfect meal. I might try over egg noodles next time. So good! Hi Rachel, love the ideas. Will definitely try this next time I make this stew! :) Thanks for taking the time to leave some feedback. Have a great week! Hi Nathalia! So cool that you are Brazilian too. Yes, this chicken stew is not popular throughout the whole country but my grandma always makes it for us in São Paulo. 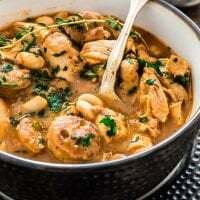 :) It’s a spin off the Russian Chicken Paprikash but the paulistas added the beans. I hope you enjoy it! Best, Olivia. I am making this recipe as I type. This is my first venture into Brazilian food that I know of. Thanks for sharing! I just wanted to send you a quick note. The step where you add the chicken & sausage from the plate back to the pot is missing. I added it in after the broth, but I wanted to let you know it is missing from the steps. My husband is Brazilian, I am American. I love that I found your blog! I can bring him some flavors from his home. I made this stew and oh my goodness! Muito gostoso! We both gobbled it up. I can not make a recipe without adding my own spin on things so I added sliced sausage, diced potatoes and broccoli florets. Of course we had it over Brazilian rice (which is, by far, the BEST rice in the world!) We both agree I’ll be making this regularly. I will also be trying some of your other recipes. Thanks! What kind/brand of chicken sausage did you use? I make this dish all of the time. Everyone loves it that I’ve made it for. I usually make it in larger quantities because it goes pretty fast. I always add a bag of fresh spinach or kale leaves and let wilt down. Any veggies would go great with this stew (I even add pineapple sometimes). I haven’t always had chicken sausage on hand, but any sausage works. Also, I tend to be pretty heavy handed with smoked paprika. It gives it a rich, almost bacon flavor, without the fattiness of bacon. Easy to make- brown the meat the night before and dump everything into a crock pot. Let cook over night on low heat, put in the fridge in the morning, and eat for dinner. Tastes even better after marinating together. Cannot get enough of this stew. I made this last night, and it was delicious. Rich and flavorful. Very easy to make. Thank you! I’m happy that you liked it! Thank you for leaving feedback!